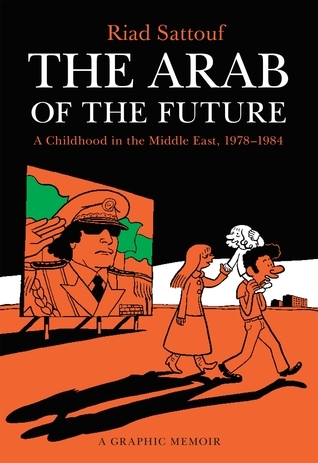 The Arab of the Future, the #1 French best-seller, tells the unforgettable story of Riad Sattouf's childhood, spent in the shadows of 3 dictators—Muammar Gaddafi, Hafez al-Assad, and his father In striking, virtuoso graphic style that captures both the immediacy of childhood and the fervor of political idealism, Riad Sattouf recounts his nomadic childhood growing up in rura The Arab of the Future, the #1 French best-seller, tells the unforgettable story of Riad Sattouf's childhood, spent in the shadows of 3 dictators—Muammar Gaddafi, Hafez al-Assad, and his father In striking, virtuoso graphic style that captures both the immediacy of childhood and the fervor of political idealism, Riad Sattouf recounts his nomadic childhood growing up in rural France, Gaddafi's Libya, and Assad's Syria--but always under the roof of his father, a Syrian Pan-Arabist who drags his family along in his pursuit of grandiose dreams for the Arab nation. Riad, delicate and wide-eyed, follows in the trail of his mismatched parents; his mother, a bookish French student, is as modest as his father is flamboyant. Venturing first to the Great Socialist People's Libyan Arab State and then joining the family tribe in Homs, Syria, they hold fast to the vision of the paradise that always lies just around the corner. And hold they do, though food is scarce, children kill dogs for sport, and with locks banned, the Sattoufs come home one day to discover another family occupying their apartment. The ultimate outsider, Riad, with his flowing blond hair, is called the ultimate insult… Jewish. And in no time at all, his father has come up with yet another grand plan, moving from building a new people to building his own great palace. Brimming with life and dark humor, The Arab of the Future reveals the truth and texture of one eccentric family in an absurd Middle East, and also introduces a master cartoonist in a work destined to stand alongside Maus and Persepolis.